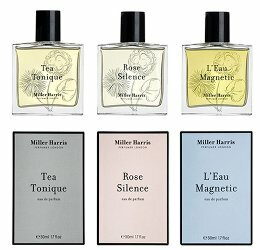 British niche line Miller Harris has launched the Editions collection, a trio of fragrances: Rose Silence, Tea Tonique and L'Eau Magnetic. Rose Silence ~ "The week is gone, the room is your own. A beam of light streams in through the curtains and you wake slowly, breathing the scent of a fresh white pillow. An unexpected embrace: faint, fresh rose with undertones of sandalwood and patchouli, untouchable yet crisp, possessing an intoxicating magic. An intimate, thrilling moment." With mandarin, blackcurrant, rose, patchouli and cashmere musk. Tea Tonique ~ "Like hearing a captivating story for the first time, Tea Tonique’s energy infuses your surroundings without overwhelming them. Beguiling and cultured, it engages its audience with musical tones and an unpredictable nature. With an infusion of Italian Bergamot suggesting smoky birch tar, it is equally at home in the English countryside or a London café, rejoicing in the many-layered characteristics of an aromatic tea." With bergamot, petit grain, lemon, smokey tea, nutmeg, mate, birch tar and musk. L'Eau Magnetic ~ "A rush of energy embracing the unmitigated chaos of the ocean. Free and unadulterated, this enlightening scent mingles salt with distant evergreen pines, embodying the spirit of a lighthearted shared experience. Notes of Italian Bergamot give an instant carefree sensation. Marine air blends with ripe citron and pink berries, with a hint of Reunion Island vanilla bourbon and Venezuelan Tonka bean for an exotic, spontaneous feel." With baies roses, bergamot, lemon, petit grain, cedre bois blanc, tobacco accord, vanille bourbon and tonka bean. Miller Harris Rose Silence, Tea Tonique and L'Eau Magnetic are available in 50 and 100 ml Eau de Parfum.